Do I need to register to volunteer? Yes. Please register on the location's event page. Registration opens approximately 45 days prior to the event. Will I receive training to volunteer? No. However, at the safety briefing, we will offer pointers to water volunteers. Do I need to volunteer for the whole event? Yes. Because we schedule the athletes for the whole event, we need all our awesome volunteers for the whole event! The two exceptions: Early Morning Set-up and Afternoon Breakdown. These two roles are only for a few hours (6:00 am to 9:00 am, and 3:00 pm to 6:00 pm, respectively). So if you can only volunteer for a few hours, sign up for one of these shifts! We encourage you to drop by and cheer if you can't volunteer for the day! You don't need to be a pro surfer to volunteer! However, you do need to be in good shape, as you'll be lifting and helping adaptive athletes throughout the day. And you should be very comfortable in the water. 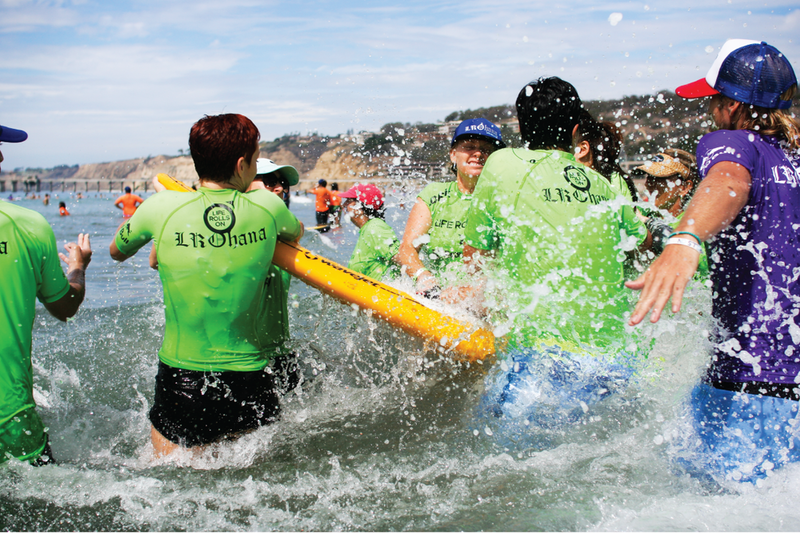 Our water volunteers tend to have years of experience in surfing, competitive swimming, water polo or paddle boarding. You don't need to know how skate to be an amazing volunteer. You'll be pushing athletes up the sides of the skate park, and spotting the little shredders. We promise it will be one of the most joy-filled days of your life. Don't have time to spend the whole day at an event? No problem! Volunteer for Early Morning Set-up. Set-up volunteers unload tables, flags and tents, and assemble everything according to the event planogram. We need outgoing, enthusiastic volunteers to welcome everyone to the event. Each athlete and volunteer needs to be checked in; and walk-ups and roll-ups need help registering. Jerseys for water volunteers are also checked out at Registration. Are you a natural host or hostess? This is for you! Volunteer to serve breakfast, snacks, lunch and beverages. You'll be keeping all the athletes and volunteers fueled for an energetic day! This role locates surfers on the beach, helps them get into wetsuits, and ready for their scheduled surf times. This role helps the event run smoothly! Though not essential, experience in Rehabilitation Therapy is helpful. Are you a can-do take-charge person? Please sign up for Afternoon Breakdown! We need an amazing crew to break down tables, tents, walkways, etc. ; organize equipment; and get it all back into the truck, and back to the storage facility. Who Volunteers With Life Rolls On? Volunteering with Life Rolls On is a great way to give back and make new friends. If you don't know anyone in Life Rolls On, or don't know quite what to do...don't worry! This is the warmest, most welcoming group in the world. Come on out! We'll make it the best day ever! Want to build trust, productivity and long-lasting connections? Bring your group! We promise you will build relationships and leave inspired! Please note: when registering, have each of your people indicate the organization name (i.e. Delta Airlines, USC Journalism Department, LA Galaxy, etc.) on the registration form. Each volunteer must register individually, as we need people's contact information and a signature on a Liability Waiver.